I like to be optimistic. I like to look forward to things. So here is my look forward to 2017 and what it might hold for me and the Other Side. First things first I know my posting frequency is going to take a hit. I have a lot of projects I need to wrap-up and the only time to do that is blogging time. Strange Brew is hitting the shelves, both virtual and physical. There is a Pathfinder version, a Castles & Crusades version (that I am really pleased with) and there is talk of a D&D 5 version. So expect to see more of that here. Additionally, I am working on the Swords & Wizardry Witch. There is already a "Lite" version now, I will release "White Box" and "Complete" versions too. One thing I have not decided on yet is whether or not to include monsters. Gaming I see Sci-fi games being big in the Brannan House. We played some Star Trek over New Year's eve and that was a blast. 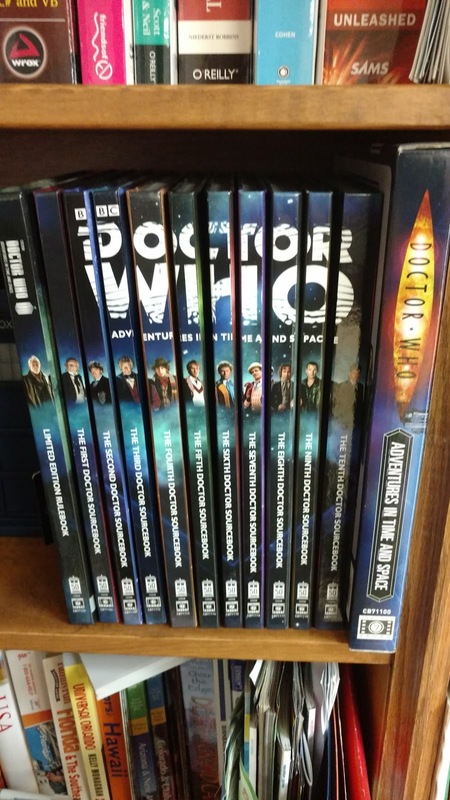 I got a bunch (all but the 11th Doctor) of the Doctor Who "Doctor" supplements for Christmas, so doing something with that would be great. Starfinder in on the way and that looks like a lot of fun. Depending on how it is I *might* update the Sisters of the Aquarian Order for it. But that is not till later in the year. I have my fingers in a couple of other projects that are not mine specifically, but I am helping out on. Having fun with Star Trek. I also have three books I'd love to get out this year for White Star. One has been on my "to do" list for 7 years (many different systems). I am also really looking forward to the new Blue Rose. So far 2017 is shaping up to be BUSY. Mutant Crawl Classics and the new Conan both drop this year. I backed both and am quite excited. I'm in love with the Zombicide board game I picked up last month and can't wait to get more expansions and play it more. I've decided 2017 is going to be the Year of the Nephilim, but I haven't quite figured out what that means. I think it might involve my first PDF supplement and/or adventure. Godless for Shadow of the Demon Lord just dropped today and Robert Schwalb has another game that I'm guessing will be Kickstarted later this year. I'm excited for what appears to be a second round for Savage Rifts. I didn't back Mutant Crawl Classics but I will take a look at it when it drops. An Icons drive version of Sorcery & Superscience also intrigues me, as does Evil hat's Dresden Accelerated using FAE. Finally, I backed Villians and Vigilantes 3E and the Unity Table Top RPG and hope to see them this year. Just picked up a copy of the old 1984 DragonRaid, and looking forward to its arrival in the mail. Haven't played that since I was 10 or 11 with my old B.A.C. buddy. In 2017, I'm hoping to learn more about how to finish the stuff I start. As far as new products coming out, I'll be paying close attention to both Mutant Crawl Classics and Starfinder. I honestly doubt I'll buy either of them (unless I get a job that gives me a much lower concern for my bank account), but I can't wait to see how the settings shape up, and I think it's really cool to see two the most successful bridges from 3.5 (well, one monolith and one niche game) get expanded into new territory.